Featuring a new cover design and padded hardcover format, Gold Medallion Award winner Experiencing God Day-By-Day is based on Henry Blackaby's multi-million-selling Experiencing God book and Bible study. Brimming with insight and seasoned with grace, this 365-day devotional reader helps to start a daily routine by focusing the mind on the Divine presence in each life. Whether selected as a thoughtful gift or as a personal resource, the book will inspire great changes while sustaining the essential habit of turning to God on a daily basis. - Publisher 365-day devotional based on the modern classic Experiencing God by Henry Blackaby. 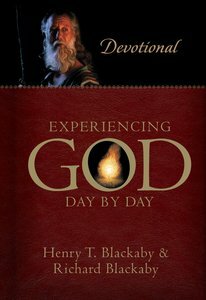 About "Experiencing God Day By Day: Devotional"
365-day devotional based on the modern classic Experiencing God by Henry Blackaby. Dr. Richard Blackaby is president of Blackaby Ministries International as well as the Chancellor of the Canadian Southern Baptist Seminary. Hes the author of Putting a Face on Grace and coauthor of numerous books with his father, Henry Blackaby, including Spiritual Leadership, Hearing God's Voice, and Experiencing God Day by Day. A former senior pastor, he served as president of the Canadian Southern Baptist Seminary from 1993 to 2006. He was also managing editor and contributing author for The Blackaby Study Bible. He and his wife, Lisa, are the parents of three children, and live in Cochrane, Alberta. Customer Reviews For "Experiencing God Day By Day: Devotional"
I have been in search for a "meatier" devotional, and Experiencing God Day by Day certainly met the criteria. I have been amazed at how true and direct the devotions are, and they seem to work in a progressive manner which guides you through different themes. The readings are confronting in a good way, as they challenge you to grow your faith and 'walk the talk'. The Blackaby's don't mince words, and they speak with respectful truth. Highly recommended. It inspires me to walk with God deeper every day, and I frequently feel compelled to share with friends the teachings I get from this book. I would be very hesitant however to give this newer Christians, as it could be too challenging. I have used this book myself over the last few years and have given it as gift to both male and female friends at different stages in their walk with God. I am continually inspired and challenged by each devotional. Many times truths which I already know hit me fresh and hard. This is one devotional that can certainly be "meat" if you choose to meditate through the day on what the Blackabys offer from God's Word. Highly recommend this book for anyone from teens upwards including new believers. I have been using this devotion daily for over a year and it is amazing. I would recommend it to anyone at any stage of their faith.